Hi there, spring is finally here, nice little break for the parents like me who has one-week off from their kid’s regular school routine. Most of the parents must be going on a trip. My friends already started posting their vacation pictures in social networking sites. In San Diego though, we can’t make much difference in weather during spring. But it’s good relief for my east-coast friends from those snow and wind chill days. Last week I was wondering what I will share next. My hands were itching to bake something and share its recipe. But before sharing those, I thought it would be better to post this comfort food that was long due in my draft. 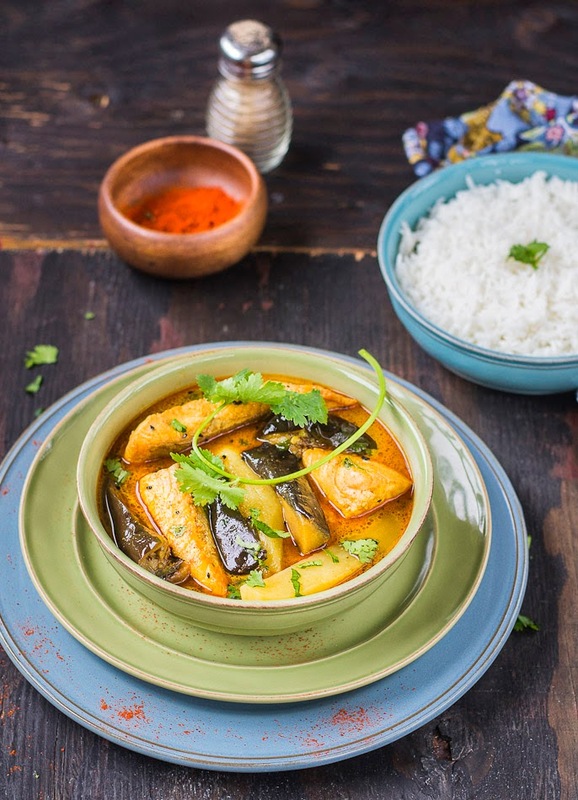 Fish curry with Eggplant is one of the regular dishes in my kitchen as well as very favorite to all of us. It’s a bowl, full of deliciousness and takes very little time to prepare. 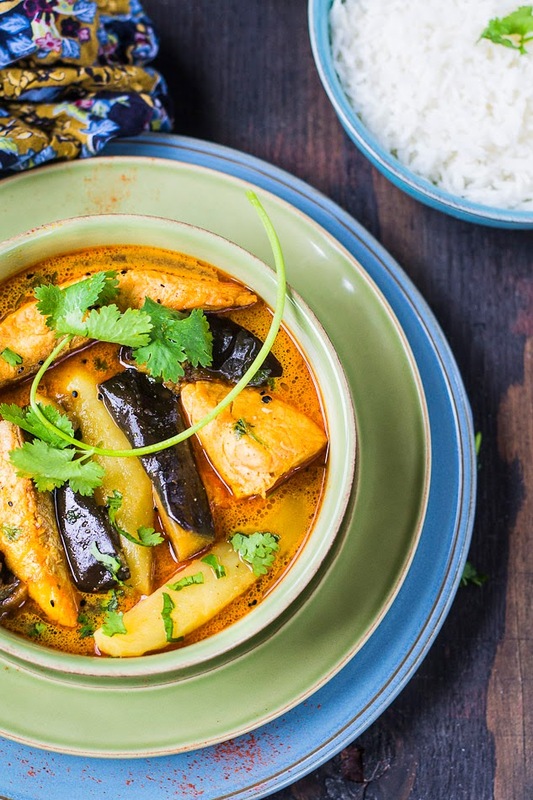 The curry is very thin and light, more like a soup or stew, loaded with fresh flavors. 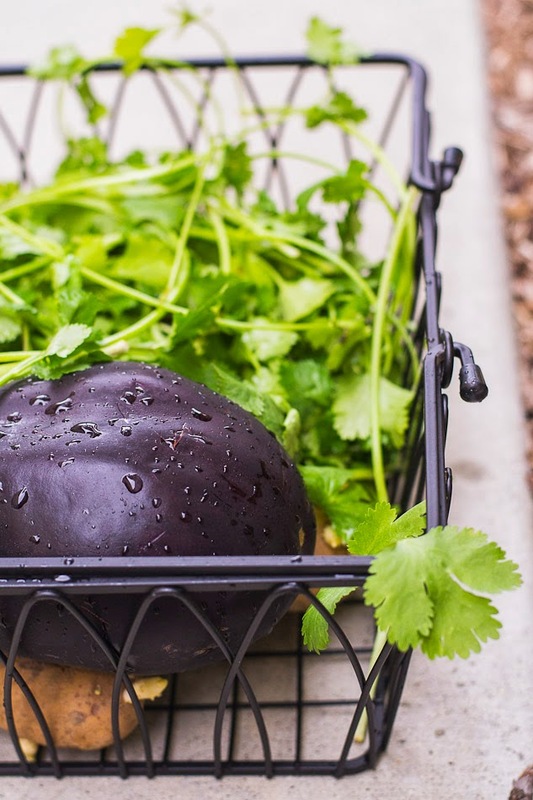 The key ingredients to create this magic are the nigella seeds, green chilies and fresh chopped cilantro apart from fish and eggplant. 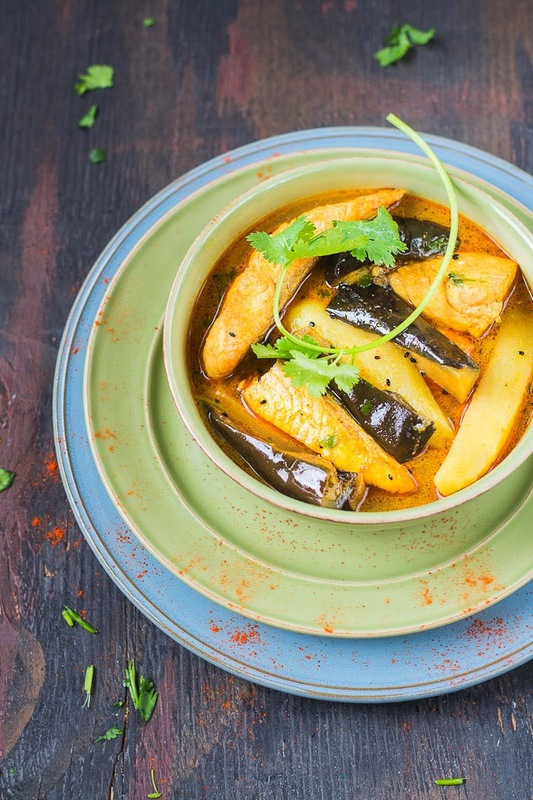 You should serve this dish with some hot steamed rice, because “Mach” (fish) goes well only with “Bhat” (rice) as we Bengali know. We grew up in a community where fish and rice are served twice a day, both in lunch and dinner. So since my childhood I am seeing my mom trying so many dishes with fish, be it some regular curry or some special one with some vegetables mixed. The most favorite one of these dishes was “begun diye ilish mach” or Hilsh fish with eggplant. Every Bengali is diehard fan of Hilsha or Ilish fish. But unfortunately we don’t get fresh Ilish or Hilsha on regular basis in the place where we live now. So we try the same recipe with sea fishes like Salmon. It’s the best substitute of Hilsha in most of the preparations including this one. Both the fishes are oily, soft and very similar smoothness in taste. A special note for my Bengali readers is that if you cook this dish with Hilsha then you don’t need to add cilantro. But when I make it with Salmon I would love to cook the following way. 1. Wash the fish pieces, wash and pat dry with paper towel. Sprinkle salt and turmeric powder and mix it well. Let it rest for 5 to 7 minutes. 2. In a big pan, preferably nonstick pan, put oil. Heat it up till smoke comes up, lower the flame to medium high and now slightly fry the marinated fish pieces on the both sides. Do not fry it for long time, just 1 to 2 minutes for each side. . Take off the fried fish from oil and keep it aside. 3. In the same oil, add the eggplant, saute it. Add salt, stir and cook it until it is brown and soft. Once it is done, take it off from the pan and set it aside. 4. Add the remaining oil to the same pan. Once oil is hot, add nigella and green chillies to the oil. Once it becomes aromatic and starts to spatter, add the potato wedges. Stir it, add salt and cook it until potato is half done. 5. Take the red chili powder in a small bowl, add two tablespoon of water and make a paste. Now add the chili paste to the pan. Cook it for 2 to 3 minutes, until oil starts coming up from the sides of pan. 6. Now add a cup of warm water to the pan and let it boil. Once it starts boiling, add salt and cover the pan with lid. Let it simmer until potato is cooked. 7. Add the fish pieces and eggplant to the pan. Cover it again and let it cook for about 5 minutes. Add the chopped cilantro. Check seasoning, add salt or green chillies, if required. Check the consistency of the sauce. 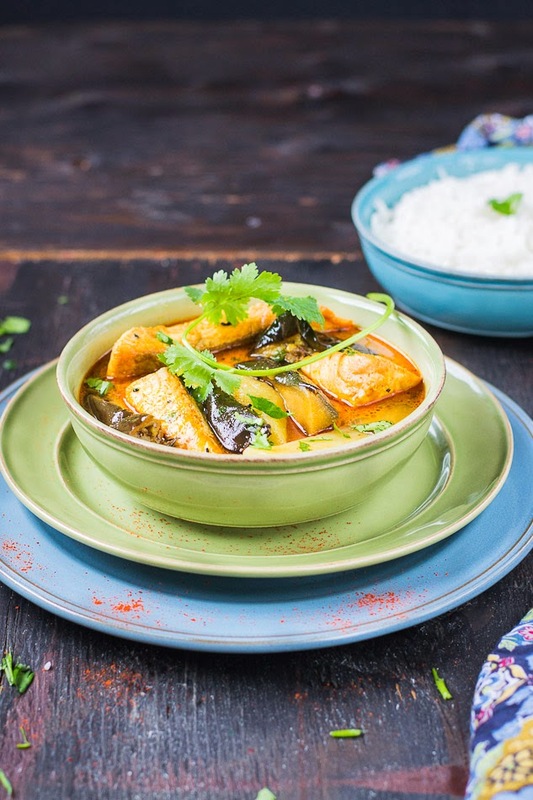 Fish Curry with Eggplant is ready, serve hot with hot steamed rice.